Preheat oven to 400 F. Put butternut on a greased sheet pan. Season with salt and black pepper. Roast for 25 minutes or until butternut is soft. Transfer to a large mixing bowl. Mash until smooth. Add egg, parmesan, and ricotta cheese. Mix well to combine. Season with salt and black pepper. Sift flour in. Add more flour if needed to form a soft dough (dough should not be sticky) Turn dough onto a floured surface. Divide dough into 4 pieces and roll into 1/2-inch thick sticks. Cut each stick into 1-inch pieces and place on a lightly floured baking sheet. Refrigerate for 1 hour or until ready to use. Heat oil and butter in a large pan over medium heat. Stir in garlic, and cook until softened. Add lemon zest, maple syrup and basil (leave some basil aside for garnish) a further two minutes to combine. Season with salt and black pepper. Set aside and keep warm. Bring a large pot of lightly salted water to a boil over high heat. 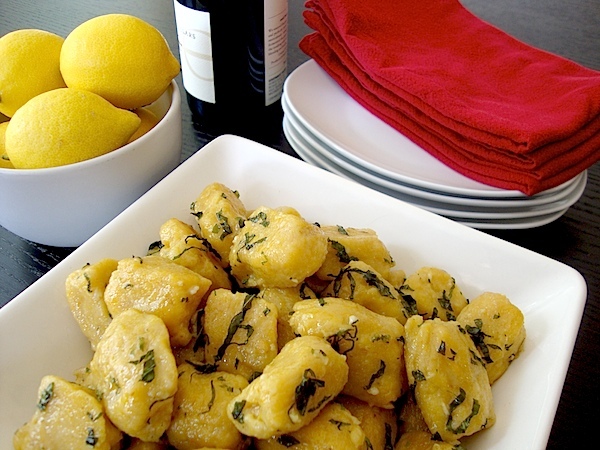 Boil gnocchi until they float to the top (about 2 minutes). Drain. Return sauce to a medium heat. Add drained gnocchi and toss well to coat and brown (about 5 minutes). Place into a large serving bowl. Garnish with extra grated parmesan cheese and basil on top. Serve as a meal for 4 people with salad greens and fresh bread of choice or as a side dish for 6 people with grilled meat and vegetables. Wonderful dish and I can really see my "Lady In The Window" making this..
We Could be Consuming GMO Food without Knowing! Would You Eat Meat Grown In a Laboratory? Onions as a Natural Food Preservative??? Skim Milk Makes You Fat?! Drug Companies Don't Want You to Know! Who is the FDA Really Working For? Is Junk Food Child Abuse? Coke Goes Green?! Really?! LOL!! Community Agriculture is a Growing Trend.